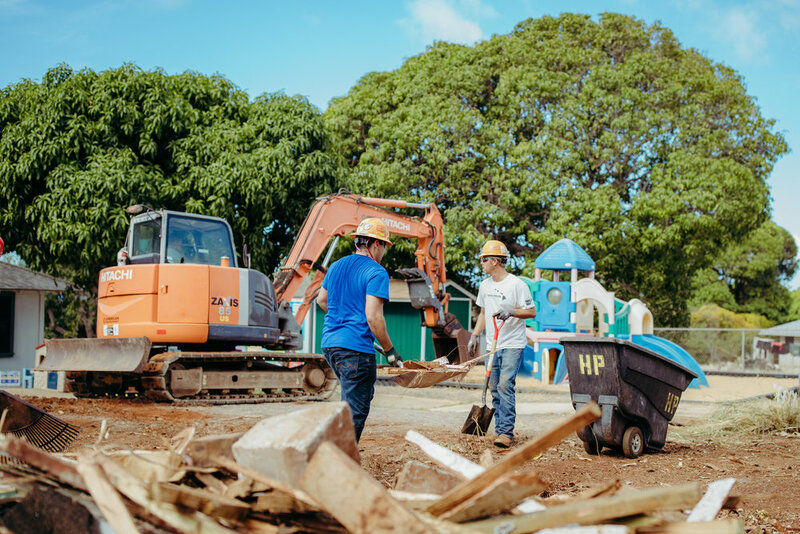 2 companies, HELIX Electric and HENSEL PHELPS, generously donated their skills, time, and supplies to help the foundation upgrade their electrical with newer and energy efficient light fixtures, and second company provided their skills and equipment to remove unsafe playhouse structure. HUGS is a local Hawaiian organization founded in 1982 that provides support for families whose children have been diagnosed with life threatening illness or disease. HUGS stands for Help Understand and Group Support. They guide parents through a difficult time and at the same time provide safe and loving environment for children to play around while parents either get support through counseling or simply get time away to regroup and recharge. Electric company founded in 1985, based in San Diego, California and one of their offices located in Honolulu, Hawaii. With 28 excellence and construction awards, HELIX has been supporting organizations such as habitat for humanity, the national Parkinson’s foundation, wounded warrior project, Ronald McDonald House, diabetic youth families, location homeless shelters, and more. Hensel Phelps is a general contractor company founded 1937 in Greeley, Colorado with one of their locations being in Honolulu, Hawaii. They have built access of over 1 million square feet of building all over U.S.A. Their community service record speaks volumes.